A refrigerator is a complex piece of machinery expected to maintain a very specific temperature day in and day out for many years without issue. But because a refrigerator operates around the clock, it’s not surprising that every now and then it might stray a bit from the temperature you set. A thermostat problem is usually relatively minor and most people adjust for it by simply turning up the settings. However, the longer you ignore the underlying cause of thermostat problems, the worse they’re likely to get. That’s why it’s important to call All Time Services as soon as you notice a problem with your thermostat. Whether your refrigerator simply doesn’t keep the food cold or it doesn’t cycle off when it is supposed to, a simple thermostat problem puts your food and possibly your health at risk, and may lead to larger problems down the road. 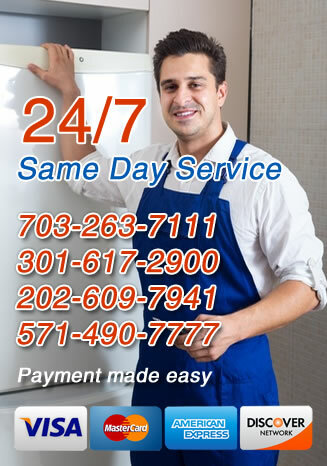 If you live in Arlington, Virginia, Gaithersburg, Maryland and the Washington, DC surrounding areas, call us now to learn more about our refrigerator thermostat repair service. If your refrigerator is not cold enough, there are a few different things that you should check. Make sure that your thermostat is on the coldest setting possible, remove anything around the fridge that could be blocking air flow, and check that that nothing is obstructing the condensing coils (usually located on the back). If your refrigerator still seems too warm, call in an appliance repair professional. They can check your fridge for bigger issues. Frozen food inside the refrigerator is a common symptom of a faulty thermostat. Because the thermostat is charged with telling the compressor when to turn off, a faulty one will result in the appliance cooling far beyond the required amount – hence the freezing. Of course, you should always do some basic troubleshooting. Make sure the dial isn’t changed to the lowest setting and that your freezer isn’t turned up too high. If the thermostat is set to the proper level and it’s still freezing your food, don’t turn the thermostat up. Just because it doesn’t work properly on a given setting doesn’t mean an adjustment in the opposite direction will have the desired effect. Instead, remove any food from the back of the refrigerator, where it is most likely to freeze, and call a us right away. While there is no danger of you getting sick from frozen food, you may have to throw away vegetables and milk, and the cost of your compressor running constantly can add up fast. 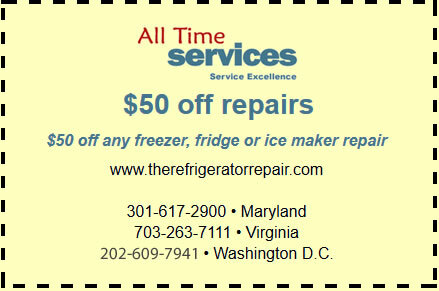 For refrigerator thermostat repair service company in Arlington, Virginia, Gaithersburg, Maryland and the Washington, DC surrounding areas, call All Time Services. We have serviced refrigerators in the region for years and are available immediately to repair whatever problems are causing your appliance’s poor performance. Call us today to learn more about our refrigerator and thermostat repair services in your area.